Such a fantastic book, I don't even know where to begin. 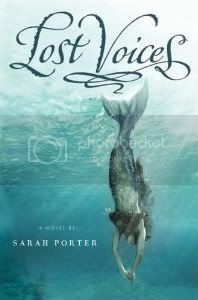 I've always loved mermaids, and I couldn't have been happier to learn that mermaids are supposed to be The Next Big Thing in paranormal fiction. 14 year-old Luce is living in a horrible home situation, and after narrowly escaping an assault by a family member, she falls from an Alaskan cliff into the sea. It doesn't seem like a direct suicide attempt, but she doesn't seem to particularly want to cling to life, either. Much to her amazement, she finds herself transformed into a mermaid. She joins a tribe of similarly transformed abused girls. The book mainly focused on the mean-girl social dynamics of the group. Catarina, a Russian girl, is the queen bee. She takes Luce under her wing... with the condition, of course, that Luce assist her in taking down ships. It turns out that Luce is a terrifically gifted singer and her siren song allows the tribe of mermaids to go after larger vessels than ever before. Catarina is harboring a secret... her goal in sinking ships is to find good looking men to briefly canoodle with before their inevitable death by drowning. Luce loves singing, but despite her rough treatment by all the humans she's known, she still clings to human morals of right and wrong and the wanton murder of shipgoers doesn't sit right with her. The introduction of Anais, another new mermaid, further upsets the balance of power, as the girls get greedy and start sinking ships for material gain. The book does a marvelous job of really immersing you in a new underwater world. The mermaids live in an abandoned bay, and rest occasionally in nearly inaccessible underwater lagoons. Luce worries at first that she won't find raw seafood appealing, but when she tries it, she finds it salty, smooth and delicious. Remembering her human memories Luce thinks that a rain shower will feel refreshing, but finds the fresh water raindrops feel dirty after the clean salt water that is her new habitat. The mythology of mermaids is fairly well-thought out. Abused girls who are in a near-death situation make the transformation. I thought the journey through pipes or whatever waterways were available was a bit of a stretch for girls who are inland. I wondered why boys in a similar situation never turn into mermen. Babies or toddlers become what the girls contemptuously call "larvae" - helpless little mermaids who are quickly picked off by other ocean life. The book ends abruptly. It's not a cliffhanger exactly, but it definitely doesn't wrap things up neatly. Happily, the book is supposed to be the first in a trilogy. I'm eager to pick up the next in this dark and lyrical series. Good to hear a good review on this as it is on my to-read list. I had high hopes for this one, and it exceeded them. Great book! I just wanted to say thank you for your lovely review! Next time I update my website I'll put in a link to it. I don't think my review does your book justice... I loved that it hearkens back to the old legends of sirens, without the sweet Disneyfication of mermaids that you generally see these days.